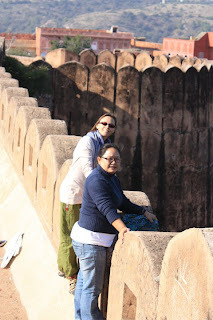 We headed out the next morning, opting for a taxi since our destination, the Amber Fort, was a few miles from the city. With the Amber Fort in sight, our driver pulled over for a couple phots. Like the snake he was carrying in a basket, a man suddenly appeared! I am sure his nose was fine tuned to sniff out tourists. Being the tourist we were, we took the opportunity to be silly although I was actually interested in it as well. The snake seemed happy enough and allowed me to ‘pet’ her soft smooth body. On the way up the winding hills to Amber Fort we passed a couple small town, one of which housed the Sri Jagat Simanji Temple. With intricate carvings surrounding the temple. We loaded back up in the taxi and arrived at the Amber Fort, parked and went inside. After paying the high tourist fee for a ticket 750 Rs (about $17) we entered the courtyard. Then into the surrounding area and buildings…Walls of mirrors and decorations, marble sculptures, ornate doorways/halls. There is ALWAYS time for a coffee break and the Amber Fort Café was conveniently there to satisfy our thirst and hunger. Full and ready for our next adventure, we headed out and were greeted by a very large momma monkey and her little baby in the parking lot.